With the “crazy” tempo of EuroNet in 2017, there is, in fact, not much time to relax and think about our participation at the 10th European Public Health (EPH) conference in Stockholm between November 1st and 4th. Therefore, we will try and use this brief report as an opportunity to 1) reflect on the Stockholm conference and 2) inform you on what happened during those 4 “action-packed” days. To set the scene, we would like to introduce the main venues of the 10th EPH conference: Stockholsmässan, Stockholm City Hall and the wonderful “Casa EuroNet”. Stockholsmässan conference venue was where all the serious work took place. Lectures, seminars, workshops, meetings and presenting EuroNet in the conference’s exhibition area. A welcome reception at the famous Stockholm City Hall made us feel like Nobel prize winners; probably in economics - for managing to achieve such a successful conference participation with almost zero budget. In our communal living place - “Casa EuroNet” - we discussed work and life… and slept a bit. We even found a sauna and spent great time all together enjoying relaxing on comfortable sofas and armchairs, listening to music thanks to an amazing sound system and great EuroNet DJs. The days were not boring at all. For example, one of us forgot his ID card in the airplane. After checking with the airport, we realized that they did not find it, but at least they knew that one day it was probably in Austria and the day after it would have gone somewhere in the world (Taiwan?). In any case, a piece of EuroNet was travelling around the world and this in some way made us proud of EuroNet potential. Stockholm gave us the chance to once again meet “old” colleagues and friends and strengthen several collaborations with other young public health professionals’ networks, like ASPHER and EUPHAnxt. 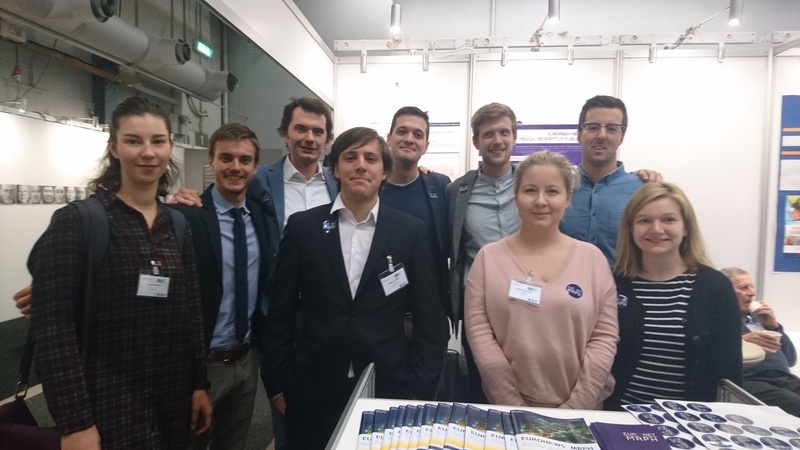 We also had the opportunity to meet fellow Young Gasteiners, to interact with EUPHA and other associations to talk about new potential internship positions. Euronet had the fantastic opportunity to share a stand with ASPHER for the whole of the conference. This proved to be a great success. We distributed dozens of newsletters and made useful contacts that will, hopefully, end up in new countries joining the network (e.g. Cyprus and Romania) and new partnerships (e.g. New Zealand). One of the highlights of the EPH conference were our stickers, which were placed in every possible badge, chest or forehead by our passionate Euronetters. As usual, Euronet didn’t take a passive role in the conference. On contrary, we were present in several sessions. Mariana and Damir presented their posters on migrants and perinatal health in Portugal as well as on politics and public health policies in Croatia during the ASPHER Young Researchers’ Forum, on the pre-conference day. Francesco gave an interesting oral pitch about a systematic review on digital health interventions he carried out and Jo chaired one of the sessions on infectious diseases topic. But it was the last day when Euronet was most present in the conference programme. We had five EuroNet’ers presenting posters: Damir described EuroNet’s internships, Matej explained the results of the Slovenian satisfaction survey, Helene presented EuroNet Platform, Jo outlined the innovative and comprehensive Welsh public health strategy and Stefano talked about an Emergency and Preparedness project he carried out with international partners. The Conference finished with Alberto chairing a workshop co-organised between Euronet, YFG, EUPHAnxt, in which Helene explained, very succesfully, her thesis to a non-scientific audience. And only in three minutes! Our “flying” member from Malta - Stefan - was always around ready to stream the conference events live to the rest of the world. It was really a great experience, we look forward for the next EPH and invite you to Ljubljana next year. Join us to make the Euronet group larger than it was in Stockholm. In 2018 the main theme of the conference will be Winds of change: towards new ways of improving public health in Europe. Could there be an EPH conference theme more suited to EuroNetters? One of the most green and livable cities in Europe that should be on your travel itinerary next year!